Artocarpus altilis generally refers to the seedless trees typical of Polynesia but it may also refer to Artocarpus camansi Blanco, a seeded species naturally found in New Guinea and the Moluccas, sometimes called breadnut (Ragone, 1997). Breadnut and breadfruit are considered different species by GRIN (USDA, 2015) and breadnut is considered a progenitor of breadfruit (Ragone, 2011). The breadfruit tree (Artocarpus altilis (Parkinson) Fosberg) is an evergreen multipurpose and traditional agroforestry species. Its starchy fruits are a staple food in the Pacific Islands. The name breadfruit is due to the flavour of the fruit after being cooked, which is similar to that of freshly cooked bread (Ragone, 2011). Breadfruit is an evergreen tree that reaches a height of 15-20 m. The trunk ranges between 60 and 120 cm in diameter and produces branches above 4 m from its base. The bark is smooth. The crown is conical in shape in the first years of growth and becomes more rounded with maturity. The leaves are alternate, dark green and smooth on their upper side, and lighter green with reddish hairy veins on the underside. They are very variable in shape, ranging from obovate to ovate entire lobs to clear pinnate dissected lobs. They are about 45 cm long but can range from 15 to 90 cm depending on variety. Artocarpus altilis is monoecious and bears male and female flowers on the same tree. Male flowers are borne on club-shaped spikes that can be as long as 45 cm. Female inflorescences are globose clusters of about 1500-2000 small flowers. Once pollinated, the flowers develop into a spherical to cylindrical, honeycombed, smooth to rough-skinned, fruit of 10 to 30 cm in diameter and 0.25 to 6 kg in weight. It has a yellow to green rind and a starchy creamy white to yellow pulp (starch content about 20%). Fruits may or may not contain seeds, depending on the variety (Ragone, 2011; Ragone, 1997). Artocarpus altilis is a multipurpose tree mainly grown for its fruits. The fruit is nutritious and a valuable staple food in most Pacific Islands. The mature fruits are eaten raw or cooked, steamed, fried, made into flour and baked, roasted or freeze-dried, or traditionally fermented. 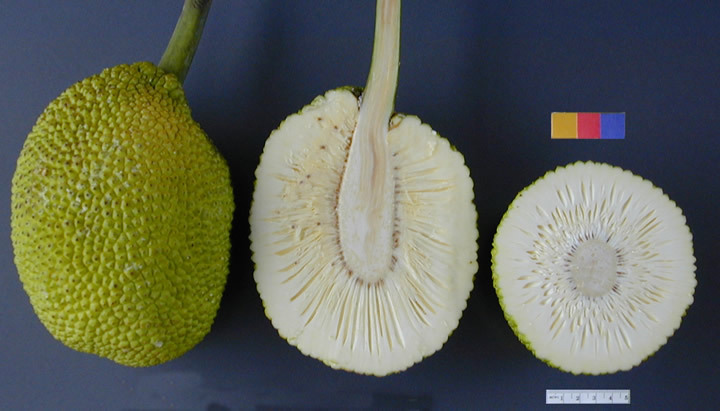 Breadfruit can be eaten at all stages of growth (Sikarwar et al., 2014; Ragone, 1997). It is canned and sold in the Caribbean and in the USA, Europe and Canada (Ragone, 2011). Young immature fruits can be boiled and are comparable in flavour to artichoke hearts. The seeds of breadfruits are edible. Sometimes referred to as breadnuts, they are eaten boiled or roasted (Duke et al., 1993). Breadfruit trees provide valuable fuelwood and low density, flexible timber, which is resistant to termites (Ragone, 2011). The fibrous parts are used to make traditional clothes, ropes and fishnets. The latex is used as a chewing gum and adhesive, and for the caulking of canoes. The burning of dried male flowers repels mosquitoes and other flying insects. 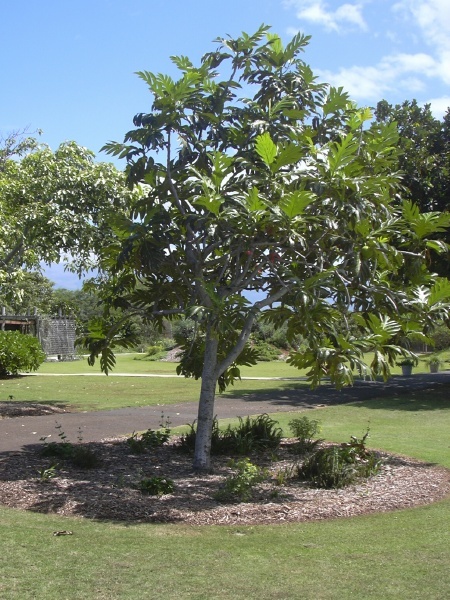 The breadfruit tree is used as an ornamental tree in Hawaii. 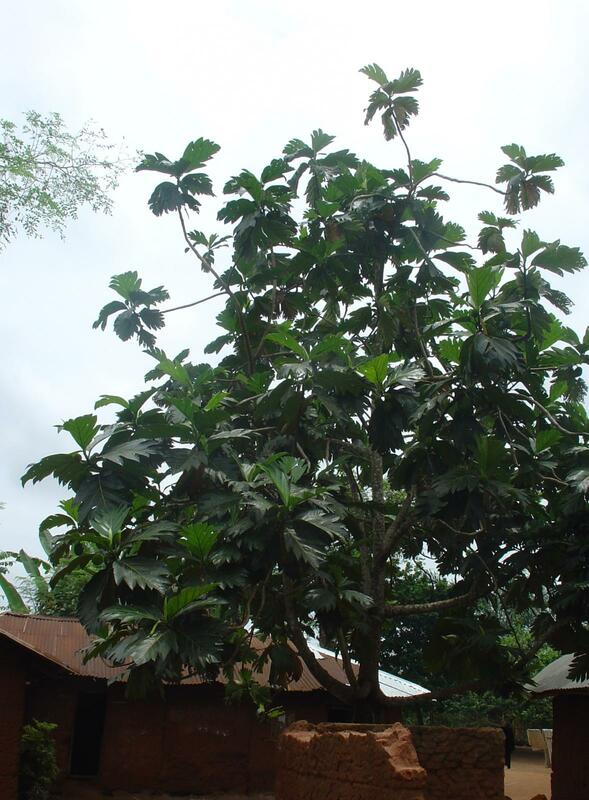 It also provides shade, mulch and can be interplanted with other tropical crops (Ragone, 2011). Breadfruit has many ethnomedicinal uses (Duke et al., 1993). The parts of the fruits that are discarded can be used to feed animals as a source of energy (due to the presence of carbohydrates) and protein (Ragone, 2011). Leaves are valuable fodder for cattle (Duke et al., 1993). Breadnut (Artocarpus camansi), the seeded ancestral form of Artocarpus altilis, originated from New Guinea, Indonesia and the Philippines. Artocarpus altilis was domesticated 3000 years ago in the Western Pacific. It is now widespread and cultivated in most Pacific Islands (except in New Zealand and Easter Island). It was introduced into the Caribbean during the late 1700s by French and English slave owners who were seeking cheap food for slaves. Breadfruit is also cultivated in Central and South America, Africa, Madagascar, the Maldives, the Seychelles, India, Sri Lanka, Indonesia, South-East Asia, and Australia (Ragone, 2011). Artocarpus altilis can grow between 17°N and 17°S and at higher latitudes under maritime climates. It grows better from sea level up to an altitude of 1550 m and where annual rainfall ranges from 1500 to 3000 mm with summer rains. Artocarpus altilis grows better in areas where temperatures range from 15°C to 40°C, optimal growth being between 21 and 32°C. It has no tolerance of frost but it can withstand some dry season. However, dry spells will compromise fruit harvest. Artocarpus altilis does well on light or medium, fertile and well-drained soils with pH ranging from neutral to alkaline. Breadfruit has some tolerance to salinity and can grow on coralline soils and atolls (Ragone, 2011). Fresh breadfruit matures in 1-3 days after harvest and is highly perishable. Shelf life can be extended by careful harvesting and pre-cooling fruit with chipped ice. Long term storage for shipment requires low temperatures (12-15°C). These are difficult to achieve under tropical conditions, where transportation to urban market centres may result in produce losses above 70% (Ragone, 2011; Oladunjoye et al., 2012). Use of fresh breadfruit for animal feeding is possible only in the vicinity of producing areas, otherwise the product must be dehydrated. Processing by cooking and soaking reduced the concentration of oxalate and tannins while trypsin inhibitors and haemagglutinin were completely eliminated by cooking. Phytic acid was reduced by soaking but not by cooking (Oladunjoye et al., 2012). In another study, cooking for 20 minutes reduced tannins, phytate and α-amylase inhibitor activity (Oulaï et al., 2014). Artocarpus altilis is a fast growing tree. Once established it can live long and remain productive for decades. Seedless varieties are vegetatively propagated from roots or cuttings and they start bearing fruits only 3-6 years after planting. During their early stages of development, the tree requires watering during the dry season. Older trees are tolerant of dry spells. There may be one or two harvests a year. Main harvest occurs during the hot wet season and a second harvest 3-4 months later. Average fruit yield is 5.5 t/ha under traditional agroforestry system on the island of Pohnpei (Micronesia), and ranges as high as 16 to 50 t/ha under orchard conditions (Ragone, 2011). Breadfruit can be intercropped with yam (Dioscorea spp. ), taro (Colocasia esculenta), cassava, banana, citrus, noni (Morinda citrifolia), papaya (Carica papaya), coffee, cocoa or a legume cover crop as it is tolerant of shade in its early stages of growth and then provides shade to its companion species (Ragone, 2011). Artocarpus altilis has spreading surface roots that stabilize the soil on the steep hillsides in Micronesia. Its dense canopy provides shade and reduces temperature. The trunks can be used as trellises for vines and the regular shedding of its leaves provides mulch to the soil, thus improving growing conditions of intercropped species (Ragone, 2011). Breadfruit trees host and feed many birds and bats. The pollen and the latex are collected by honeybees (Ragone, 2011). Fresh breadfruit has a high water content (65-72%). The flesh of the fruit is rich in starch (63-74% of DM) and low in fibre (crude fibre less than 8% of DM) and protein (less than 6% of DM). It is palatable and a good source of energy for all classes of livestock (Göhl, 1982). Breadfruit contains several antinutritional factors: oxalate, tannins, phytic acids, trypsin inhibitors, α-amylase inhibitor, haemagglutinin and saponins. These substances result in lower performances in pigs and poultry fed large amounts of breadfruit, and it is recommended to process them before feeding (Oladunjoye et al., 2012; Ortiz et al., 2011; Oulaï et al., 2014). The reported value for antitrypsin activity (more than 20 TIU/mg; Oladunjoye et al., 2012) is of the same order of magnitude as that of raw soybean seeds. In humid tropical countries, breadfruit is a source of carbohydrates (starch) used as an energy supplement for small ruminants. Breadfruit must be supplemented with a protein source due to its low protein content. In Cuba, sheep managed on tropical pasture and supplemented with 12 or 20 g/kg body weight of a mixture of breadfruits and leaves of breadfruit trees had higher daily weight gains (113 g/d at the higher level and 97 g/d at the lower level) compared to those left unsupplemented (67 g/d). Breadfruit supplementation did not modify carcass characteristics or meat quality. 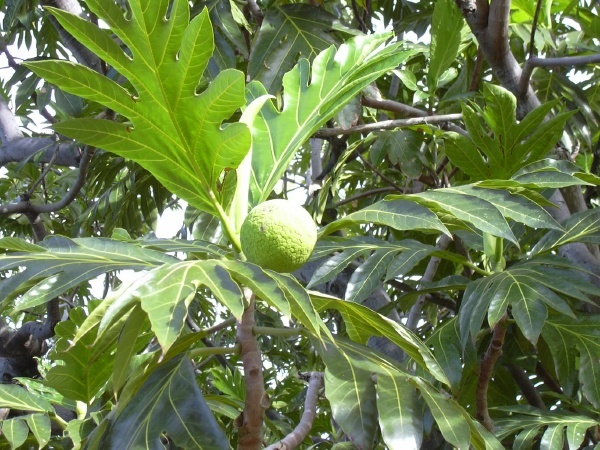 Adding breadfruit leaves increased the protein content of the supplement (Leyva et al., 2007). In Samoa, whole breadfruit flour included at 43% into a complete diet fed to young growing goats resulted in a daily weight gain of 69 g/d (Aregheore, 2005). Flour of peeled breadfruit included at 57% into the concentrate diet of growing goats led to better weight gain and digestible energy than cassava (Aregheore, 2000b). The flours of whole breadfruit, peels or pulp offered as supplements to growing goats fed with forage had no adverse effect on animal performance. Breadfruit pulp flour gave the best results in terms of daily weight gain (175 g/d) compared with whole breadfruit flour (82 g/d) and breadfruit peels flour (114 g/d), although DM digestibility was higher with breadfruit peels flour. Breadfruit pulp flour gave the best feed conversion ratio (feed:gain) with 4.8 compared to 8.8 and 7.4 for whole breadfruit and breadfruit peels flours, respectively (Martin et al., 2003). In Nigeria, increasing levels of breadfruit (5 to 49.5%) in a diet with Guinea grass hay did not change total DM intake but increased DM digestibility from 62 to 73% (Bosman et al., 1996). Over-ripe fruits of Artocarpus altilis are given to pigs in Micronesia (Merlin, 2016). In Cuba, breadfruit meal was used to replace maize grain in growing and fattening pig diets (Brea et al., 2013; Ortiz et al., 2011). In growing pigs, it was found that up to 15% (diet DM) breadfruit meal could be fed to animals without compromising feed intake or animal performance (live-weight gain, feed intake, feed conversion ratio, quality of meat) (Brea et al., 2013). In fattening pigs, inclusion of levels higher than 10% resulted in decreased animal performance, which was attributed to the presence of tannins and saponins. However 20% and 30% breadfruit meal in fattening pig diets significantly reduced feed costs (Ortiz et al., 2011). Several studies showed that breadfruit meal could be used at moderate levels (10%) in broiler diets without adverse effects on growth performance and feed efficiency (Adekunle et al., 2006; Ravindran et al., 1995). At higher inclusion levels, some authors observed a reduction in growth performance with raw breadfruit meal (Adekunle et al., 2006), while other obtained good results at 20% breadfruit meal in the diet, and above (Valdivié et al., 2003; Ravindran et al., 1995). Cooking breadfruit improved performance at high inclusion levels (Adekunle et al., 2006). This beneficial effect could be due to the destruction of some antinutritional factors (Oladunjoye et al., 2010). It is concluded that breadfruit meal can be used in poultry diets at 10% of the diet. Higher levels would need testing, with emphasis on feed formulation and meal preparation. Breadfruit seed meal reduced growth performance and feed conversion of broiler starters when included at 3.5% of the diet and the negative effect was very strong above 10% (Nwokoro et al., 2006a). Feed intake was less affected at moderate levels of breadfruit seed meal, but decreased at levels above 10%. Similarly in broiler finishers, growth decreased linearly with increasing levels of breadfruit seed meal, and feed efficiency was also decreased (Nwokoro et al., 2006b). It is, therefore, not advisable to use breadfruit seed meal in poultry feeds. For rabbits, sun-dried Artocarpus altilis fruit is a potential source of energy. Though the protein content is low, protein digestibility is relatively high: 72% (Leyva et al., 2012). In Nigeria, breadfruit meal was introduced at up to 10-20% as a substitute for maize grain in a complete diet, without a significant alteration of growth performance (Oladele Oso et al., 2010). When introduced at 25% of a balanced diet, the nutritive value of breadfruit meal fed to growing rabbits was higher when the fruits were cooked (30 min at 100°C) before sun-drying, and even higher when they were fermented for 5 days in water (Oladunjoye et al., 2012). In Cuba, a 90-day study with growing rabbits showed that the average daily gain of rabbits was reduced by only 4% when they received only breadfruit meal and forage from perennial soybean (Neonotonia wightii), which contained 19% crude protein in the DM. In a third group of rabbits, growth rate was reduced by only 11% when they received a pelleted diet composed of breadfruit meal (40%), breadfruit tree leaves (58%), and minerals and vitamins (2%). In this study the relatively high content of breadfruit tree leaves (19% of DM) compensated for the low protein content of the fruit. The DM and crude protein digestibilities of this "all breadfruit" diet are high, at 82% and 72% respectively (Leyva et al., 2012). The calcium and phosphorus contents of breadfruit are generally low and cover only 8-10% and 30%, respectively, of the requirements of growing rabbits (Lebas, 2013).